Chinese companies are scouring Africa for resources to fuel a red-hot economy back home, but Beijing is interested in more than just what's underground. In Kenya — which has few natural resources — the Chinese are building a massive highway and truck factory, and jockeying to construct a new port. Kenyans say it's all part of a broader Chinese strategy that is winning friends, opening markets and causing unease. The highest profile project is the Thika Road superhighway. Three Chinese companies are building a 31-mile road from the Kenyan capital of Nairobi to the city of Thika. In some sections, it's 16 lanes across. Peter Ngau, who teaches urban planning at the University of Nairobi, says East Africa has never seen anything like it. "There's no comparison," he says. "It's a showpiece of the government." Ngau says the highway will increase business and help expand the Kenyan economy. 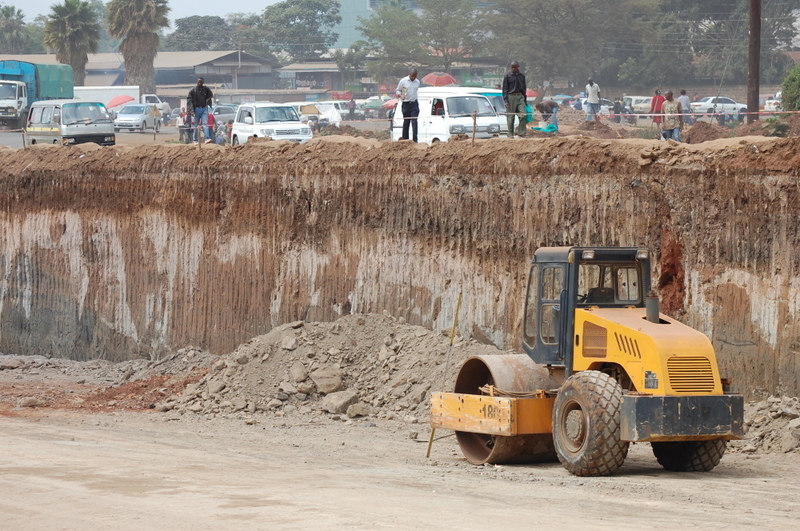 The road will help link Kenya to Ethiopia, a major regional economy with about 80 million people. Apartment buildings are already sprouting along the sides of the highway. It's also expected to ease some of Nairobi's crippling traffic. It takes Ngau two hours to drive down the road to class each morning. When the highway is finished, he expects it will take him less than 40 minutes to get to work. Why are Chinese companies building this superhighway? Aside from profit, Ngau says, the project is a means to a greater end for China. One reason much of Africa remains poor is a lack of basic infrastructure. 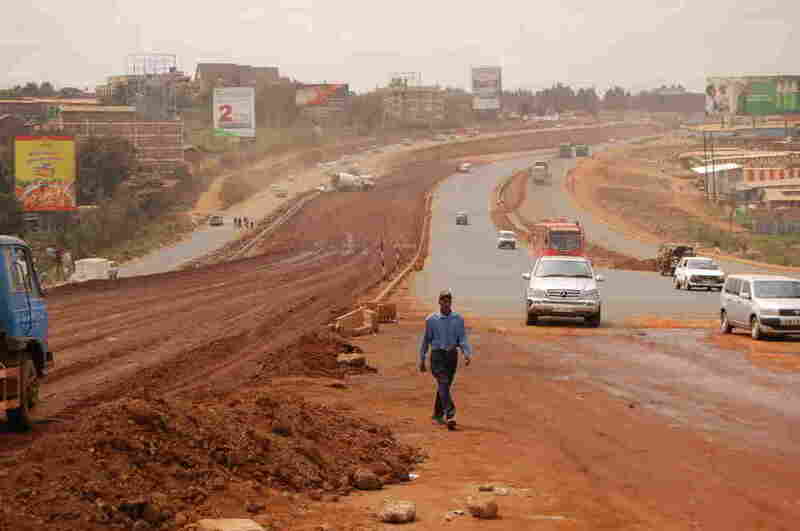 Kenyans hope this new superhighway will cut travel time and boost trade. "I think Chinese are trying to buy favor," he says. "One of the biggest challenges in African countries has been poor infrastructure. African people are happy with them, because the roads are better with the Chinese." Chinese roads are not only building good will — they're also helping Chinese businesses penetrate the continent. "China is seeing Kenya as a gateway to the East Africa community," says Joseph Kieyah, an economist with the Kenya Institute for Public Research and Analysis, a government think tank. Kieyah says East Africa's economy is about $75 billion. And, along with the economies of other countries on the continent, it's growing. The International Monetary Fund estimates that seven of the world's fastest-growing economies over the next five years will be in Africa. China already does booming trade with Kenya. Between 2005 and 2009, Chinese exports here more than tripled to $860 million. They include furniture, textiles and machinery. Most of the Chinese products are genuine, but others are fake. Some end up in a storeroom in downtown Nairobi run by Kenya's anti-counterfeit agency. There are fake Yamaha electric guitars, fake Peavey drum sets and boxes of fake Staedtler pencils stacked nearly to the ceiling. "The fakes from China are so rampant in Kenya," says Caspar Oluoch, an agency inspector. "Right now, if you walk through the streets of Nairobi, you will find so many fakes there." As business ties between the two countries have grown, Chinese counterfeits have followed. Kenyan businesses estimate they lose more than half a billion dollars annually to fakes — mostly Chinese. A.G.N. Kamau, the chairman of the anti-counterfeit agency, says he's written to the Chinese Embassy twice about the problem. "But we haven't received any response up until now," he says. Some businesses say Chinese companies get special treatment because China is so powerful. Steve Smith, the recently retired managing director of Eveready East Africa, says the Kenyan government gave a Chinese company a waiver several years ago. The waiver allowed the company to import batteries without paying a mandatory 35 percent duty. Smith says he eventually persuaded the government to reverse the decision, but not before the Chinese company had taken a chunk of his market share. "We were in the 70 to 80 percent share," Smith says. "Now, we're below 50 percent." Smith says that for years, Eveready had resisted automation to maintain employment levels. "But once this happened, we said, 'This has to change,'" Smith recalled. "So we have automated our packing line and a lot of Kenyans lost their jobs because of it." Smith says his company laid off more than 300. Like their products, the Chinese themselves are a growing presence in Kenya and much of Africa, and that's having an impact on the country's signature resource: wildlife. Every few months, police at Kenya's Jomo Kenyatta International Airport seize smuggled shipments of elephant ivory. Full Steam Ahead For China's Rail Links Abroad? "Most of the arrests have been of Chinese origin," says Patrick Omondi, head of species conservation and management with the Kenya Wildlife Service. Police caught a Chinese man in late April traveling through the airport with more than 200 pounds of ivory. Omondi says Kenya has been hesitant to raise the issue with the Chinese Embassy. "It will be sensitive, because we are looking for help from China on so many things," Omondi says. NPR made repeated calls and sent texts to the embassy in Nairobi to discuss China's role in Kenya. Embassy officials never responded. Esmond Bradley Martin, who studies the trade in elephant ivory and rhino horn, says both animals are increasingly in danger because prices and demand are growing as China's economy expands. "Horns have been appearing in London at these natural history sales," says Martin, "and before, the price used to be quite low. And now, they're paying up to a $100,000 for a pair of black rhino horns." Martin says Chinese buy rhino horn to use as a traditional medicine to lower fever. With the Chinese economy "growing at 9 to 10 percent, now average Chinese can afford to buy rhino horn," he adds. Chinese and Vietnamese demand for rhino horn is now so strong at least one private reserve in Kenya gave its remaining rhinos to the government. The owner said she could no longer afford to protect the animals from poachers. From the grasslands to the highways, China casts a long shadow here, but what is China's ultimate impact? "Overall, I think it's a positive influence," says Ngau, the urban planning professor.